Leon Barnett has been recalling the two seemingly insignificant moments that signalled all was not well with his health - and eventually led to Monday’s announcement that he has been advised to retire from being a professional footballer due to a serious heart complaint. The first came in the Cobblers’ Carabao Cup clash at Wycombe Wanderers in mid-August, when the 32-year-old complained of tiredness and an increased heart-rate during a game in which he would normally have been in cruise control. The second came in the 0-0 draw with Bury at the PTS Academy Stadium in early October, when again the player’s heart-rate was high and he just didn’t feel right - which is of course a huge understatement. Because as it turns out, Barnett was suffering from a heart condition that medical experts have ruled means he can no longer live the life of a professional footballer, as it would be too risky. Following that initial complaint to Cobblers physio Nacho Herrando on the pitch at Adams Park, the wheels were set in motion behind the scenes to find out what exactly Barnett’s problem was. He had a heart-rate monitor inserted into his chest, and it was alarming results from that tiny instrument following the Bury game that led to father of three Barnett ultimately having to accept that he has to retire. And although the former Wigan Athletic, West Bromwich Albion and Norwich City man admits that giving up the career he loves is a ‘heartache’, he knows he simply has to quit for the good of his health, and the good of his family. Asked about the sequence of events leading up to Monday’s announcement, Barnett said: “The first time was Wycombe away in the Carabao Cup, and just before we went to penalties I mentioned to the physio that I had started to feel a bit tired. “I felt like my heart was beating faster than the activity I was doing. “My heart felt like I was doing 10 box-to-box runs, but I was literally just jogging, so I said to the referee ‘can I have a bit of a breather’. “I mentioned it to Nacho just before the penalties, and Northampton handled it well. They said they would put me in touch with a cardiologist and go down that route. “It then happened a second time in the game against Bury, and after that game I told Nacho that I was feeling it again. “We went to the cardiologist and they dowloaded the data, and they found out that my heart was going at just under 300 beats per minute, which is unbelievable. Barnett has not trained or played since leaving the field following the draw with Bury, which was Keith Curle’s first game in charge of the club. But as time went on, the reality dawned on Barnett, who last week finally got the confirmation he was dreading - that his football playing days are over. 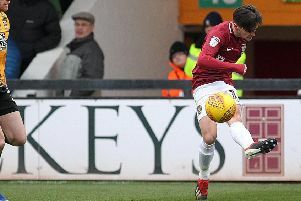 “It has been tough over the past few weeks as I didn’t know what to expect, and I didn’t know what the next step was going to be,” said Barnett, who signed for the Cobblers in the summer of 2017. “Even my missus though ‘come on, you’re having me on a bit”, because I had been going into training every day and didn’t feel anything then. He does have to say goodbye to playing, but Barnett will still very much be part of the Cobblers family. Chairman Kelvin Thomas has agreed to honour the player’s contract, and Barnett will be offered the chance to do some coaching with the club’s youngsters as well as be around the first team scene under the watchful eye of Curle. Coaching is something that Barnett was already preparing for, as he is currently doing his badges and already runs a training school for youngsters in and around his Luton base called the Leon Barnett Academy. Barnett admits he has been taken back by the club’s support, particularly over the fact they are honouring his contract until next summer. “I am so thankful,” he said. “I wasn’t even thinking about the contract to be fair, and it is a massive thing for the club to still give me what I signed up for, and I will do all I can to repay them. “Obviously, I have not even done half the job this season (as a player) so I owe them a lot. “The process they have gone through with me, booking the cardiologist and speaking to professors, I know that is not a cheap job and they have been there the whole way through. “I am very thankful for everything they have done, and I need to repay them. It is obviously a testing and traumatic time for Barnett, who has been a professional footballer since he was 16, which was the age he made his debut for Luton Town. “If you start dwelling on the past and the present, then you will end up struggling quite badly mentally,” said Barnett.